During the final days of the legendary Cassini mission, the NASA spacecraft performed a series of ring-skimming orbits around Saturn, snapping unprecedented images of the gas giant’s enigmatic ring moons. These photos and other data have now been analyzed by astronomers, shedding new light on these elusive objects and the origin of Saturn’s majestic rings. Saturn has about 60 known moons, a small handful of which are parked inside, or closely interact with, the planet’s ring system. New research published today in Science is dropping some new knowledge about five of these ring moons—Pan, Daphnis, Atlas, Pandora, and Epimetheus—including details about their shape and composition. The new paper, led by Bonnie Buratti from NASA’s Jet Propulsion Laboratory and the California Institute of Technology, is also providing new insights into Saturn’s ring system and how it might have formed. The five Saturnian ring moons included in the new analysis: Pan, Daphnis, Atlas, Pandora, and Epimetheus. Cassini’s six ring-grazing orbits occurred between December 2016 and April 2017, with the mission coming to an end in September 2017 when the probe deliberately crashed into Saturn. The images taken by Cassini were stunning, showing moons unlike anything ever seen before. Take Pan, for example, a five-mile-wide (8 km) moon with distinctive grooves on its surface and a bulging equatorial ridge reminiscent of a tutu. Daphnis sits in a precarious orbit within a gap in Saturn’s ring, and it also features a “skirt” around its equator. Indeed, these five inner moons—none of which is wider than about 12 miles (20 km)—are quite peculiar, featuring unconventional shapes, surface features, and colors. What’s more, they appear to have a close, but poorly understood, relationship with Saturn’s rings. Equipped with the new Cassini data and these unprecedented close-up images, Buratti and her colleagues were able to take a deeper look into these mysterious objects. Buratti and her colleagues were also looking for clues to figure out if Saturn’s rings formed in the wake of a celestial collision, and if the copious amount of material within the rings gave birth to the ring moons. Indeed, the disk of rock and ice around Saturn could be analogous, and involve similar processes, to the Sun’s protoplanetary disk (from which the planets, including Earth, formed) during the early days of the Solar System. Finally, the researchers were hoping to see if volatile chemicals other than water ice exist on these ring moons. The distinctive geology of these five moons, according to the analysis, resulted from a complex, multi-stage process in which the objects formed from congealing ring material. Strong tidal pressures, and the slow accumulation of ring particles, caused the grooves and ridges to form on the surface. It thus appears that the moons and the ring system formed from one giant impact. Maps showing segmented geological features of Atlas (A), Daphnis (B), Pan (C), and Pandora (D). In regards to the weird colors, Pan is the reddest while Epimetheus is the bluest. Buratti said she was “quite surprised by how red in color Pan was,” noting that the moons “get redder as you get close to Saturn, which further suggests their surfaces have accumulated ring particles.” The chemicals responsible for the colors, and the processes involved, aren’t yet fully understood, but it could involve red chromophores—a mixture of organics and iron. Ice particles or water vapor from Saturn’s E-ring and water vapor from volcanic plumes on Saturn’s moon Enceladus could be contributing factors, according to the paper. As for volatiles other than water ice, none were found to exist on the surface of the ring moons. The lack of volatiles, therefore, is yet further proof that the ring moons formed within the rings, and weren’t scooped up by Saturn’s intense gravity. Physical dimensions and steepness of Pan’s surface features. 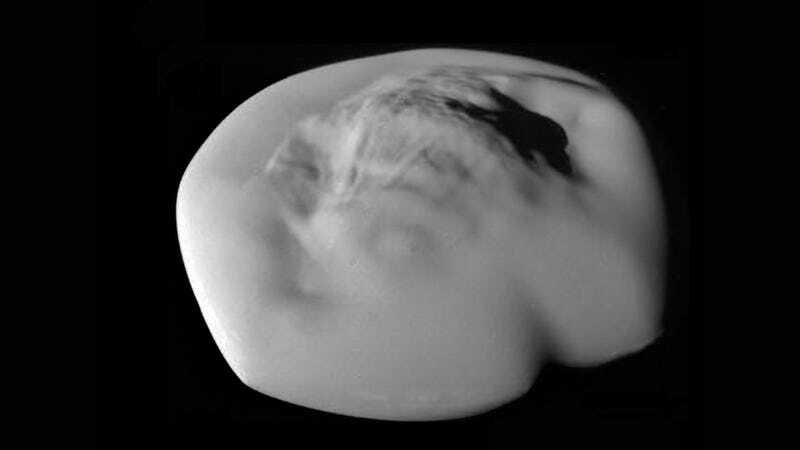 The coolest part of the study, Harrison said, is that the strangely ravioli-shaped moons—Pan, Daphnis, and Atlas—acquired their appearance by basically collecting ice and dust particles from Saturn’s rings around their equators as they moved along in their orbits. As for her favorite ring moon, that distinction goes to Pan. Like Harrison, Becker is also intrigued by Pan, particularly the variations observed along its equatorial ridge. She wants to know why the thickness and extent of the ridge is so variable around its surface. Becker said future studies should look into this and figure out how and from where the ring particles are being collected onto the moon’s surface. Another interesting (though not completely surprising) observation, said Harrison, is that the closer a moon is to Enceladus, the bluer it is—likely the result of all the water ice and vapor spewing out from Enceladus’ south polar geysers. The new paper is also significant, said Becker, in how Saturn’s rings can be used a proxy for the disks around young stars where planets form—including the beginning of our own Solar System. “Having images and measurements of the satellites that are embedded within the rings is one of the best ways imaginable to learn about how planets form, grow, and interact with the disk,” said Becker. Without a doubt, Saturn is one of the most fascinating and intriguing objects in the entire Solar System. It contains worlds within worlds, and thanks to the late-great Cassini, we’re fortunate enough to be able to witness these alien places.